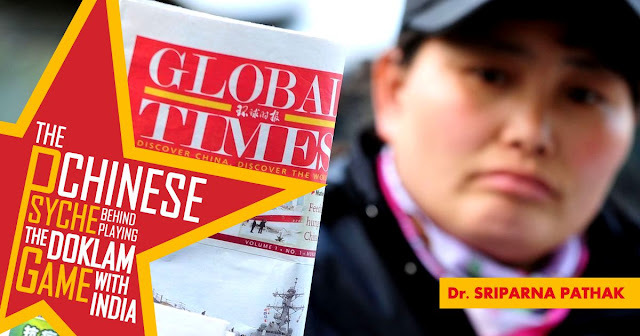 Strengthening its hardline rhetoric with a video titled ‘Seven Sins of India’, the official Chinese news media Xinhua followed up with another video which apparently is a part of a series called ‘Talk India’. Given the fact that the earlier video was not dignified by even a comment from India, this was more placid compared to the other. Since the onset of the Doklam standoff, the Chinese media, as well as its officials, are engaged in a play of words in condemning India. Given this context, though the media propagated warnings do not call for much deliberation, however, what becomes pertinent to analyze is the rationale behind such a behavior by the Chinese media. To explain, first, this can be attributed to the expectation that the parroting of the same story of China being the victim will lead to an actual validation of the claim. Such a behavior can be linked to the illusory truth effect in psychology, wherein, the idea is that repetition of something often enough will slowly make others believe it. Even though the illusory truth effect has been known in the world of psychology since 1977, the Journal of Experimental Psychology more recently found out empirical evidence to prove that the effects of repetition have stronger effects than were previously known. Image Attribute: Doklam Plateau, Source: Google Maps / Layered analysis provided by the author. In June 2017, China attempted to extend a road from Yadong to the Doklam plateau southwards towards what is called the Doka La pass. However, Bhutan formally objected to China’s road construction in the disputed area. 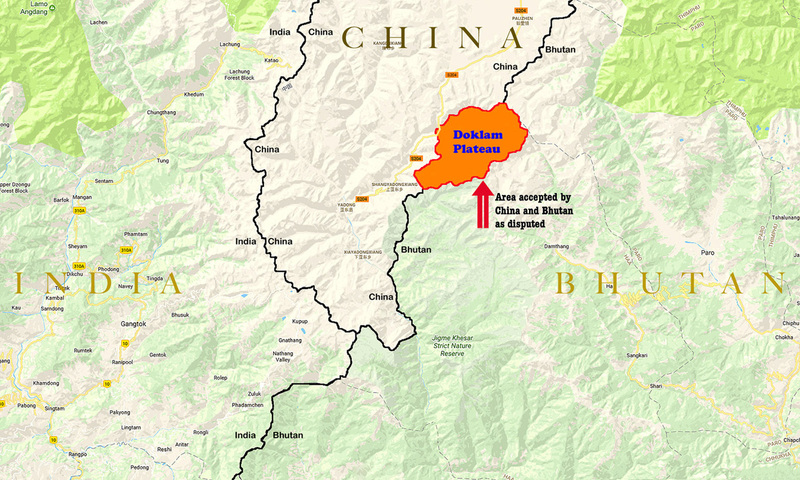 As stated by the Bhutanese government, China attempted to extend a road that previously terminated at Doka La, towards the Bhutan army camp at Zornpelri near the Jampheri Ridge. What finally ensued was the standoff between the Indian and the Chinese armies respectively as Indian troops blocked the Chinese attempts to build the road. As a result of the standoff, the Chinese media started referring to the area as the tri junction, which is actually centered at a place called Gymochen, further down of Batang-La (as outlined in the map below) which was taken as the tri junction prior to the standoff. Image Attribute: Google Maps / Layered analysis provided by the author. To argue, with such a strategy, one of the intended purposes of distracting attention from how China has laid claim stealthily to additional land has been served. Contrasted to illusory truth is the phenomenon of evasion and diversion as manipulation tactics. As stated by Dr. George Simon, side stepping (like constantly harping on how China is a peaceful country and India is the aggressor) is what an issue dodger seeks to advance at the expense of the other, while simultaneously managing their own impression. 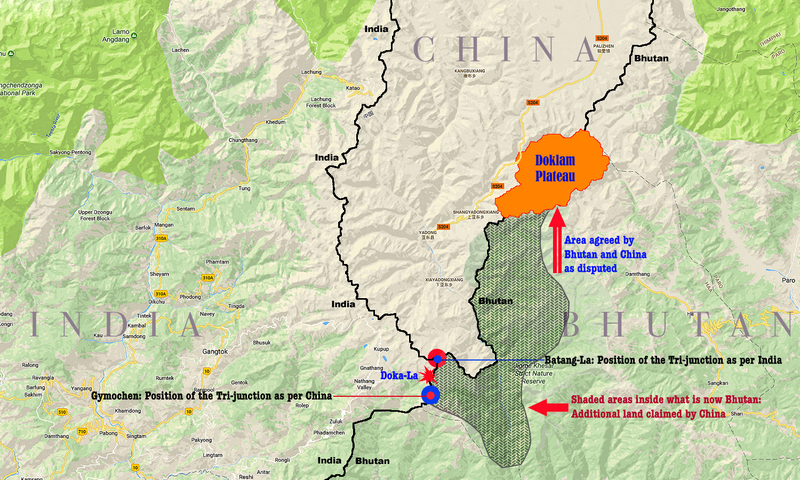 The Chinese media, with their constant hurling of threats, hard-line stands and by repetition of how Doklam is a Chinese territory has managed to sweep under the rug the very fact that the tri junction of the dispute was further north ahead. Additionally, by playing the victim card, it is also trying to manage its own impression in the world- of being at the receiving end of violence, however, the fact is the exact opposite. For this purpose, China has even sought the usage of outright lies, assuming that Bhutan- which has been the most silent out of the three countries involved will continue to remain silent, and Chinese lies will not be caught. 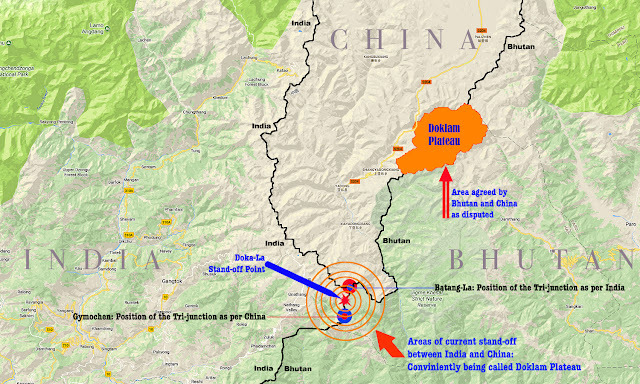 China’s top diplomat on the boundary issue, Wang Wenli lied to a visiting Indian media delegation that Bhutan conveyed to Beijing through diplomatic channels that the area of its standoff belongs to China and is not its territory. In response, a day later, the Government of Bhutan categorically refuted the Chinese foreign ministry’s bluff that Bhutan had conveyed through diplomatic channels to China that tri-lateral border standoff in Doklam is not its territory. 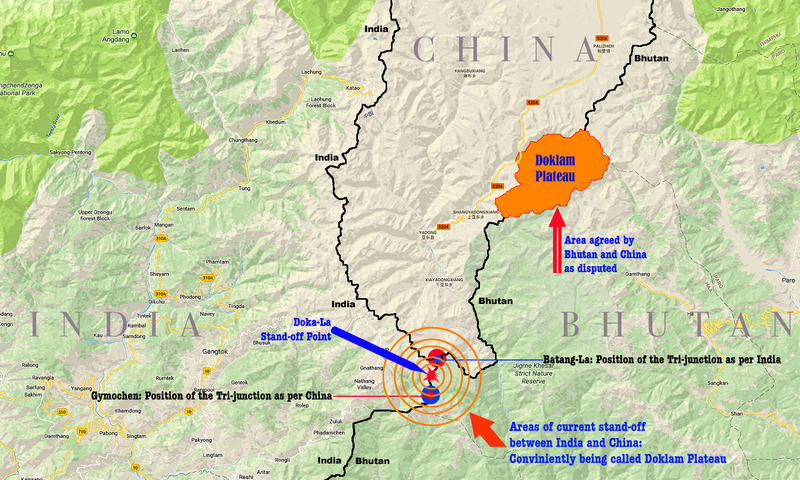 Previously, on June 29, the Bhutanese government had categorically stated in a press release that construction of the road in the Doklam area by the Chinese military is inside Bhutanese territory. Another plausible reason behind the Chinese media’s ratchet is linked to the illusory truth phenomenon, even though the effect imagined is a move beyond the one created by the illusory truth phenomenon. As compared to the Cold War period, diplomacy in the 21st century also encompasses foreign governmental action influencing the domestic politics of a state through targeting its civil society directly. The state controlled Chinese media is applying this tactic even on Indian audience and members of the civil society with the hope of the effect of the illusory truth syndrome. Wherein, once the effect is established, the audience could then put pressure on its domestic government, as exemplified in the way American civil society once pressurized its government to pull its troops out of Vietnam about 20 years ago. To suggest, China, with its army is locked in a standoff is also using its state controlled media to unleash a psychological war against India. This makes it imperative to understand the way it is playing the dispute psychologically so that India can avoid getting psychologically subdued. As China has already used tactics of threats and humiliation against India, however, what motivates such behavior calls for significant deliberation. Dr. Sriparna Pathak is an Assistant Professor in the School of Humanities and Social Sciences, Assam Don Bosco University, Tapesia Campus, Sonapur, Assam, India.